The starting nine for the beginning of the season is pretty much set but the composition of the bench is still up in the air. With 12 pitchers and a full-time designated hitter that limits the Tigers to four reserves to cover eight positions. 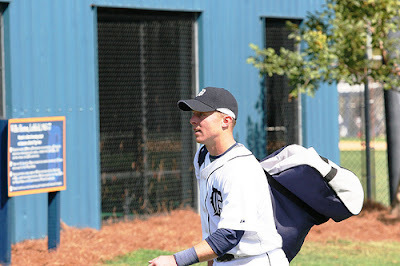 Much depends on the status of Brandon Inge and the health of Vance Wilson. The probability of Inge being traded has been going up and down all winter. He would still like to be traded and they would like to move him but there hasn't been a lot of interest and both sides are open to the idea of him remaining with the Tigers. With Jim Leyland's recent comment that their is a strong possibility of a trade, it's looking like he might not be back. It's far from a certainty though. The other wild card is Vance Wilson. There is still a question as to whether he'll be ready for the beginning of the regular season after undergoing Tommy John surgery last summer. Any decision on Inge is reportedly independent of Wilson's health status. One has to wonder whether that's totally true though. After all the bold moves this winter to put the team in a position where they are a favorite to win the AL central, it would be to tough to go into the season without an experienced backup catcher. If Inge and/or Wilson are available then they would be locks for the opening day roster. The other lock at this point is Marcus Thames who could platoon with Jacque Jones in left field and backup Carlos Guillen at first base. Even if Leyland does not go with a platoon, Thames would be their top right-handed bat off the bench. The next closest thing to a lock would be Ramon Santiago, although if Inge can play some second and Shortstop and Ryan Raburn can play second base, Santiago might not be necessary. If not Inge or Wilson, then who would be the backup catcher? Among the spring training invitees, the most major league ready catcher is believed to be 28 year old Dane Sardinha who caught for the Toledo Mud Hens last season. Sardinha has a lifetime minor league OPS of .600 and only 5 major league at bats but has been in AAA for four seasons. Other outside possibilities are Maxim St. Pierre and Nick Trzesniak. Each has the equivalent of close to a year of AAA experience. Other players competing for roster spots, especially if Inge is not around, are Mike Hessman (first base/ third base), middle infielder Mike Hollimon (.282/.371/.478 for Erie in 2007), center fielder Freddy Guzman and left fielder Timo Perez. Guzman's value is that he is the best defensive center fielder and fastest base runner available. Perez has a chance because he had a great September for the Tigers and is one of their few left-handed hitters. You might ask why I put Perez on one list (without Raburn) but Raburn on two others (without Perez). It's because I don't think there would be as great of a need for Raburn with both Inge and Thames on the roster. In that case, I think Leyland might take the left-handed batting Perez or the switch hitting Guzman instead. However Raburn's versatility and right-handed bat would be more valuable in the absence of Inge. So that's my view of the bench. I'll take a look at the pitching later in the week. Who was the best Tigers base runner in 2007?